"Former media baron Conrad Black says that when he renounced his Canadian citizenship to sit in the British House of Lords he was only doing so “temporarily,” and meant to re-apply until he was sidetracked by his legal troubles south of the border. 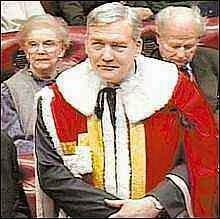 Black said Monday he was not turning his back on Canada itself when he gave up his citizenship in 2001 to become Lord Black of Crossharbour. Then-prime minister Jean Chretien had enforced an old law that said a Canadian citizen cannot become a British lord while retaining Canadian citizenship. Has the old fart actually renounced his title or does he think that, having become a Brit in order to be made a Lord, that he left some citizenship intact in Canada that he could revive at his convenience? I recall what that bag of crap had to say about Canada and the Canadian people on his way out the door and those weren't the remarks of someone planning on coming back anytime soon. Well, if Lord Black was a member of Harper's Northern Foundation of 1989? I thought that was why, Harper permitted Black back into Canada? Wasn't Lord Black a member of, Harper's Northern Foundation of 1989? I thought Black was Harper's propaganda machine and that was why he was permitted, back into Canada?